I was sent a complimentary copy of this novel by the author in exchange for an honest review – thank you very much! After that he notified me in another email that the book had been re-edited and its cover improved; therefore I am going to treat the copy I got as an ARC – without criticizing or assessing its spelling and other mistakes. Marcus Wright works as a reporter but his long-lasting ambition has always been to follow the steps of Indiana Jones – you know, looking for fascinating artifacts in exotic countries, fighting criminals and kissing lovely girls who swoon at the mere sight of you. He studied two years in Cairo, Egypt and got the archeology bug. He also fell in love with Katherine Beaumont, a girl not only beautiful but also clever. Still life rarely hands you down your wishes. Day-to-day television reporting drudgery is what Marcus must face in order to earn a living. He is surrounded by vapid male and female anchors who, despite their pretty faces, have zero personalities and about as much intelligence. One day something unbelievable happens – the pennies-pinching Channel 9 management decide to send Marcus abroad, to Israel, with a crew. It is an unprecedented occasion for him to get a break from the tedious reality and use his rusty Arabic too. Still the real aim of his reporting is to create enough shockwaves to bring bodies of American citizens who have died in a suicide attack back home because everybody deserves a proper burial. Why the Israeli don’t want to send them where they belong home? Will he manage to change their mind? What else will he uncover? The author in his selling pitch assured that he’d visited every single place he writes about. Let me assure you in turn it can be clearly felt while reading his thriller. There are some details which you simply cannot invent, no matter how vivid imagination you possess, and they create a special atmosphere in a book. I could feel that atmosphere in this novel no problem. I also really liked how the reality of working for a television channel was portrayed – once again it was pretty clear that Mr. Reany was honest and knew very well what he was writing about. It was also nice that Marcus Wright, the main lead, didn’t have to save the whole civilized world single-handedly. His romantic interest, Katherine, was an independent professional – always something I appreciate in thrillers. One scene almost won me over – when Marcus declined a silent pick-up from his gorgeous colleague, Angie because, no matter how gorgeous, she was also a manipulating, scheming bimbo. However, next moment he had to hear that strange voice dictating him what to do and the whole bonus turned immediately into a huge disappointment. I still appreciated the nice and logic version of the demise of the order of Templars and an explanation why nobody so far has been able to find their much touted treasure. Overall I had problems with suspending my dispelief, e.g when Marcus Wright defeated seven (sic!) mean Palestinian guys attacking him simultaneously in a narrow alley. That narration device caused me to sigh more than once; also because of it poor Marc lost a lot of credibility in my eyes even if his creator assured me that his hero had the proper martial arts training and could defeat practically everybody. Sorry, not buying it, no way. Three to one is almost an execution, a training or no training because you don’t have your eyes around your head; seven to one is a death sentence two times over. There were several infodumps but they were mercifully short and some of them also rather interesting. Also the first person narrative voice of Marc meant that the rest of characters seemed to me a bit flat and schematic. Although the author wrote a lot to ensure me as a reader that he has nothing against normal, ordinary Arabs his baddies were the epitomes of cardboard cut-outs. Pity. My feelings are a bit mixed. Although I enjoyed the factual part of this thriller the characters were, in my very humble opinion, not fleshed out properly. Despite my sympathy for Indiana Jones I couldn’t warm up to Marcus Wright. Still the cover is lovely. 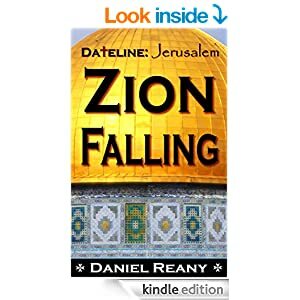 This entry was posted in ARC, book review, contemporary, religious, thriller and tagged contemporary thriller, Daniel P. Reany, Dateline Jerusalem-Zion Falling, meh. Bookmark the permalink. Who doesn’t want to be Indiana Jones?!? Pursuing this generally leads to tears, however. Completely agreed – life is not a string of adventure and romance moments, interrupted by a wilde chase or two. The job of an archeologist is dirty, boring and repetitive for most of the time. Oh well – for the rest we have those Indiana Jones DVDs. Movie script material? Sounds like it should work and I’m sorry that it didn’t, at least that it wasn’t better. It might work as a movie better but only with a very charismatic actor playing the main character.